Chelsea vs. Fiorentina : 6 August 2015. This was a strange evening and a strange game. In the current climate, a home friendly is a pretty rare occurrence anyway. With our predilection for foreign climes and summer tours, a warm-up match at Stamford Bridge has been a very rare event over the past decade or so. I didn’t bother with last season’s game with Real Sociedad and, if I am honest, the only reason that I decided to attend the game with Fiorentina was because I had attended our other three “International Champions Cup” games in the US. I set off from work, alone, at 3.30pm to complete the set. My main concern for the evening was the probable traffic chaos in London likely to be caused by the planned one-day tube strike. I sped as quickly as I could along the M4. At Reading Services, I spotted a father and daughter in Chelsea blue. Ah, the game. I hadn’t thought much about it until then. This would be our first ever match with the viola of Florence. My very first encounter with them was on a muggy Sunday afternoon in late May 1989, when I watched a dull 1-1 draw between Juventus and Fiorentina in the home end at Stadio Communale. Apart from my first-ever sighting of Roberto Baggio – the eventual transfer of him between the two clubs would heighten animosities which exist until this day – my main recollection from that balmy Italian afternoon took place with around fifteen minutes of the game remaining. Around 1,500 Fiorentina paninari – Timberland boots, Best Company T-shirts, Armani jeans, Burlington socks, Invicta backpacks, Schott bomber jackets, sunglasses, attitude – got a signal from their leaders, or maybe a phone call from their Juve counterparts, and quickly packed up their banners in the away end and left the terraces en masse, intent on disturbing the peace of an Italian summer on their way back to the city’s train station. Ten years later, I was in Turin again, when Juventus boasted Zinedine Zidane and Thierry Henry in their team, and watched as Antonio Conte scored a very late winner against Fiorentina. He famously went down in Juve folklore that afternoon by sprinting over to the visiting Viola fans and taunting them with a black and white corner flag. As a Juve sympathiser, there was a frisson of excitement about seeing them again sixteen years later. As expected, I did hit some slow-moving traffic, but further out than expected. Ironically, the last section into London stayed relatively clear. At 6.15pm, I was inside The Goose, but in the strangest of circumstances. Nursing my first SW6 pint of Peroni of the season, I soon realised that there was not one single person in the pub that I recognised. I felt like I was in a parallel universe. This was going to be a strange one alright. Thankfully, a few friends soon arrived. Mick mentioned that he might have to leave just after half-time because of the expected ninety minute wait at the two closest mainline stations. For once, I was glad that I was driving and the master of my own destiny. The Bristol Four soon arrived and we chatted about the pre-season. We briefly spoke about Kenedy, the Brazilian lad who appeared in our team against Barcelona in Maryland. We all agreed that we could not remember the last time that a “trialist” ever appeared in our team. It’s an odd one. Like something from the amateur days of the pre-war years. Although I was not too bothered about seeing the introduction of the first team squad to the spectators at 7pm – a full hour before kick-off – I wanted to have a leisurely stroll down the North End Road and Fulham Road. I soon noticed US-style pennants hanging from street-lights celebrating our Championship of last season, with torso shots of all of our players looking all mean and moody, and intent on repeating in 2015/2016. I approved. It added a little to the streetscape around Stamford Bridge. It was difficult for me to judge the size of the crowd. I didn’t expect a sell-out, especially in lieu of the London Underground strike. The place seemed busy enough. I didn’t spot any Fiorentina fans outside the stadium. I had decided to purchase a ticket in the East Upper for a change. What with the chances of the modern Stamford Bridge being demolished within the next few seasons, it might turn out to be one of my last visits. I promised myself to take more than my usual share of photographs. A different angle, a different perspective, lovely. I had a great position in the towering East Stand, in row seven towards The Shed. The place was filling up nicely. Flags had been positioned by each seat. It was soon obvious that there were many more youngsters in attendance than usual. By all accounts the pre-game introductions were a little over the top with their US-style razzmatazz. What next? Players being parachuted in from the skies above next season? As kick-off approached, the area around myself was full. There were chattering kids behind me, plus many more within sight. The next generation was well represented and it was good to see. Stamford Bridge looked a picture. I like the fact that each of the four stands are slightly different, with idiosyncrasies, yet there is a common design to all. I am stirred that the new stadium designs echo these slight variances. The usual banners were out, though I noticed a few – Captain, Leader, Legend for example – looking rather faded and forlorn. Our team contained several surprises. Begovic – Aina, Zouma, Terry, Traore – Mikel, Loftus-Cheek – Cuadrado, Oscar, Moses – Falcao. It would be home debuts for four. I am sure that Ola Aina is in for a fine future at the club, but my main worry is that his name contains too many vowels for a defender. Am I the only one who thinks our home shirts and shorts are – nicely – a deeper and darker shade of royal blue this season? They are certainly darker than the mid-blue of 2012-2013. Fiorentina, sadly but not surprisingly, showed up in white / white / violet. Asmir Begovic did well to get down low within the first minute to save a rasping shot from distance after a simple passing move cut into our defence. We then enjoyed long spells of possession and our best twenty-five minutes of the evening. With the sun setting in the north-west corner, lighting up the sky nicely, I was settling down and enjoying this. Victor Moses, one of the stars in the United States, was again showing real promise in his determination and desire. Ruben Loftus-Cheek was impressing with his finesse and strength. We were playing some nice stuff. We were treated to a lovely Rabona from Oscar on the goal-line to my left. I detected a foreign accent in the chap’s confused response, so I then decided to talk my way through the game with the Shed season ticket holder to my left. We had a good old natter throughout the match. Mikel had been doing the simple stuff well, but then caused much merriment with an effort on goal which more resembled a defensive tackle. Fiorentina then gradually took hold of the game. They kept the ball well and our play deteriorated alarmingly. On the half hour, a long raking drive smashed against Begovic’ crossbar. We had been warned. Soon after, Begovic saved well but could not smother the ball leaving an easy tap-in for Rodriguez. The Fiorentina manager – ex-Juventus player and ex- QPR manager Paulo Sousa – was watching down below from the technical area and was increasingly pleased with his team’s performance. The little knot of away fans, no more than 150 in the bottom corner of The Shed, roared with approval too. They were, surely, mainly ex-pats. There was one “Viola Club Stockport” flag. Fiorentina gained control and we struggled. The game went flat. The noise, hardly tumultuous, reduced too. At the interval, the Chelsea Women – in coats, they must have been feeling the cold – were introduced by Neil Barnett with the recently-won FA Cup. 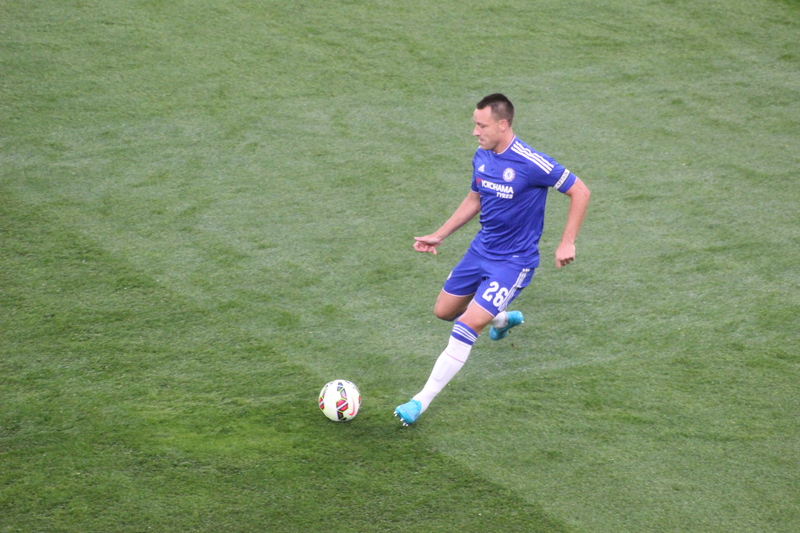 Mourinho changed the personnel at the break, with Azpilicueta, Cahill and Ivanovic joining Zouma in defence. Matic replaced Mikel. The impressive Moses was sadly replaced by Ramires after the second of two knocks. In truth, the second-half resembled the second-half at Wembley on Sunday; we enjoyed the majority of the ball, but found it difficult to break the opposition down. The frustration was starting to seep down to the players from the stands. Ivanovic seemed to be, again, a main source of our attacks, but again annoyed me with his final ball. As the game progressed I saw him getting increasingly annoyed with things. On one occasion he turned to the bench and had a proper rant, his face clearly contorted with rage about something or other. “He had a face like a bulldog licking piss off a nettle” as the saying goes. The comparison with the cool and calm and seldom-flustered Azpilicueta on the other flank could not be more dramatic. Jose Mourinho, too, seemed to be increasingly annoyed. There were wholesale changes from both teams on the hour mark – on came Willian, Hazard, Fabregas and Remy – and Mourinho took dislike to the amount of time that Sousa orchestrated a similar amount of team changes too. It turned out to be the longest break for substitutes I can remember. Joaquin, a visitor to Stamford Bridge with both Real Betis and Valencia in previous years, appeared among the viola substitutes. It was one name that I recognised. With more established quality in our ranks, surely a goal – and the inevitable win on penalties – would come now. Chelsea controlled possession but seemed to take forever to get going, and I lost count of the number of times the ball was passed laterally. We did improve when Willian, Hazard and Fabregas linked on a few occasions, but chances were rare. A Gary Cahill header from a Fabregas free-kick went close, and we all wondered how Remy, on for the quiet Falcao, managed to shoot wide from close range. A rather agricultural – no, bloody clumsy – challenge from Kurt Zouma on a poor Fiorentina player – caused much merriment in the seats around me. It was, quite simply, one of the ugliest tackles that I have seen for a while. The atmosphere, roused at times, was pretty quiet now, and parents with young families began to leave early on their long and tedious journeys home. I had commented to the Shed Ender to my left that I was impressed with the attendance. It looked to be at the 35,000 mark. Imagine my surprise when a full house of 41,435 was announced. Again, even for a friendly game, tickets sold rather than spectators in seats is used. It’s an odd one. Undoubtedly, there were empty seats around the ground too. Even so, on a night of massive travel disruption, this was a great attendance. Despite five minutes of extra time, no equaliser was forthcoming. I was a little subdued on my slow exit from a warm and sultry Stamford Bridge. And although I wasn’t – honestly – reading too much in to our rather lacklustre performance against a well-drilled Fiorentina team, I knew full well that out there in cyberspace, thousands of virtual Chelsea fans were throwing themselves off the nearest bridge, building or balcony as we endured another pre-season loss. How these people would have coped in 1975, 1979 or 1988 beggars belief. I wanted to get home as quickly as I could. Sadly, the journey home turned into one of farce as the roadworks on the A303 meant that I was severely re-routed, almost as far as Southampton damn it, and didn’t get home until 1.30am. Others, living in London, were still catching one final night bus. This entry was posted in Season 2015-2016 and tagged 1989-1990, 1998-1999, 2015-2016, Antonio Conte, Branislav Ivanovic, Fiorentina, Jose Mourinho, Juventus, Kurt Zouma, Paninari, Paulo Sousa, Stamford Bridge, USA by Chris Axon. Bookmark the permalink. And yes, you are right, the new home shirt is significantly darker than previous adidas kits especially the 2012/2013 gold trim kit. Seemed to be wearing huge trainers though. Like clown’s shoes.